Don't want the hassle of selling your car privately? We'll buy your car straightaway, upload your car details and get a price online! Everyone knows you get a better deal with cash in your hand, upload your car details and get a price online! Dealer Offering you nothing for your Trade In? Selling Your Car has never been easier! Simply enter your car reg, add some details about your car and get an offer online! Thinking of importing a car but no trade in options? No problem, we'll buy your trade In, upload your car details now! Add your car details and tell us about your car! Most people hate having strangers call to look at cars, do I let them drive my car? Do I go with them? should I ask about insurance? People are naturally awkward when trying to do a deal, the whole process can be quite stressful. We've come up with a solution to this problem - CashOfferNow.ie will buy the car from you! Yes, you read that correctly, we'll buy the car, we'll do the deal online so everything is 100% clear before we start. I sold my car through Cash Offer Now and would recommend them, simple, straightforward and hassle fee, easier than selling privately and deal done straight away - car collected and paid for with 3 days, great service and well done! I have to say, after being messed around by car dealers on trade in prices and waiting for people to call me back, almost begging dealers to take my business, this is a breath of fresh air, great services and so needed for the Irish market, well done and I wish you every success! Upload your car details so we can give you a price. Do We Ask Any Difficult Questions? We'll ask you lots of difficult question here like "What's the Reg" so be sure to have it ready! What is the overall condition of the car? Add as many good quality photos as you can? Do you have a full service history? Do you have a second set of keys? Any major marks or scrapes? Any damage to the upholstery? Is there any finance outstanding on the car that'll need to be cleared as part of this deal? And that’s it - we'll then get you a price for your car! If you're happy with the price, we'll arrange to call out "Inspect and collect"
Inspect is a confirmation of everything you submitted online along with some security checks on VIN numbers and the registered owner. The service is free unless we complete a deal to buy the car. CashOfferNow.ie charges the fees shown below on completed deals for cars. With the cost of advertising and hassle of people calling out to test drive your car, we think this represents good value. Q2: What happens if I don't have the log book? We can't buy your car unless we get a valid log book and proof of ownership. If you've lost it, you can get a replacement one - but please make sure you are in possession of it as we cannot complete the deal without this. Q3: What if the Reg LookUp doesn't find my car? The National Vehicle Database can find most cars, but on occasion it doesn't. If this happens, we need to go back to enter the following data manually: Year, Make, Model, Variant and all the usual information. Don't worry though, we'll still be able to give you a price and we can call you if we need clarification on anything. Q4: What checks do you do when you come out? The inspector looks at hundreds of cars each week, so he'll give it a quick once over to make sure it’s exactly as you described it. He'll do simple checks to make sure the car is not a write-off which has been repaired and he’ll ensure that the security numbers all match. Q5: What if the car isn't as described? We reserve the right to cancel an offer should the car not be as you've described it. So, make sure the description is 100% correct and the photos are recent and accurately show your car. Any damage not mentioned will only slow down the process at inspection. Q6: How long is the offer valid for? CashOfferNow.ie are buying the car from you. 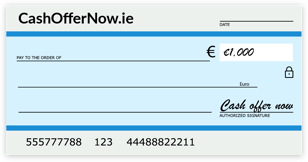 CashOfferNow.ie have been in business for 22 years and we’re the first company to launch a motoring site in Ireland in 1996. We like to see ourselves as innovators and this is a new service to Ireland that has proven to work very successfully in other countries. Q7: Why would I sell my car to you and not a dealer or privately? The offer is valid for 7 days. If you don’t accept the offer within 7 days, you will need to re-submit. Q8: What if someone offers me more? That’s an easy one, take it.